President Trump on Friday signed sweeping new orders tightening refugee and visa policies including suspending almost all refugee admissions for four months and indefinitely barring entry for some Syrians. Trump said the new measure was intended “to keep radical Islamic terrorists out of the United States of America.” The executive order also suspends visa entry into the U.S. from seven terror-prone countries: Syria, Iran, Iraq, Somalia, Libya, Sudan and Yemen. Liberals of course are going crazy. They say that Trump created this order because he is Islamophobic. They’ve even come up with a ridiculous comparison, “Anne Frank was a refugee also.” Indeed she was, but the reason for Trump’s action was totally different from the reason Anne Frank and many like her were prevented from coming to the US. Trump’s executive action was made to prevent terrorists from coming into the United States. 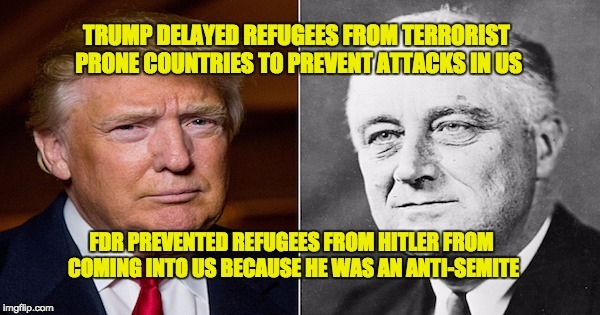 FDR prevented refugees from coming into this country because they were Jewish and he thought America didn’t need any more Jews. In June 2016 then CIA Director Brennan said during congressional hearings that one of the ways terrorists infiltrate western nations is by embedding themselves within groups of refugees. 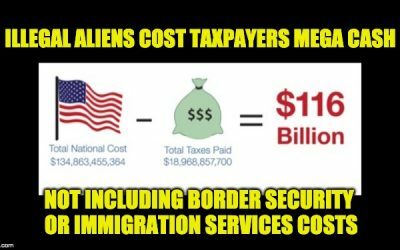 And the group is probably exploring a variety of means for infiltrating operatives into the West, including refugee flows, smuggling routes, and legitimate methods of travel. Further, as we have seen in Orlando, San Bernardino, and elsewhere, ISIL is attempting to inspire attacks by sympathizers who have no direct links to the group. Last month, for example, a senior ISIL figure publicly urged the group’s followers to conduct attacks in their home countries if they were unable to travel to Syria and Iraq. President Trump’s action delays acceptance of refugees until the DHS can figure out how to ensure they’ve kept the embedded terrorists from hiding within the crowds of legitimate refugees. His motivation is to prevent terrorist attacks in the United States. In the case of the Holocaust, the Nazi’s weren’t embedding themselves with the Jewish refugees. It wasn’t even suspected. The Jewish refugees were kept out because FDR was a bigot, his hatred of Jews caused thousands to be added to the ranks of Hitler’s victims. Some point to the fact FDR didn’t bomb and destroy the train tracks that were shipping Jews to the concentration camps. Others say that bombing wouldn’t have prevented anything. The real question needing to be explored is why didn’t FDR allow more Jews into the country? And why didn’t he pressure Britain to allow Jews to move from Nazi controlled areas into what was then called Palestine? In the book “FDR and the Holocaust: A Breach of Faith,” historian Rafael Medoff suggests that Roosevelt failed to take relatively simple measures that would have saved significant numbers of Jews during the Holocaust, because his vision for America was one that had a small number of Jews. In other words, FDR doomed many Jews to suffer not because he wanted them to die, but because he didn’t want more Jews living in his neighborhood. In 1936, he characterized a tax maneuver by the publisher of the New York Times as “a dirty Jewish trick.” In 1938, FDR privately suggested to Rabbi Stephen S. Wise, one of the era’s most prominent American Jewish leaders, that Jews in Poland were dominating the economy and were to blame for provoking Antisemitism there. In 1939, Roosevelt expressed (to a U.S. senator) his pride that “there is no Jewish blood in our veins.” In 1940, he dismissed pleas for Jewish refugees as “Jewish wailing” and “sob stuff.” In 1941, President Roosevelt remarked at a cabinet meeting that there were too many Jews among federal employees in Oregon. Perhaps his distaste for Jews was the reason that, while there were many actions FDR could have taken to stop or slow down the Holocaust, he didn’t. “He could have quietly permitted the immigration quotas to be filled to their legal limit — that alone would have saved 190,000 lives,” Medoff said. (…) Upon arrival at Cuba, the St. Louis was not allowed to dock. Captain Schroder worked for a week in vain to allow his passengers to disembark. He was denied. Only 22 Jewish refugees were allowed entry as they did have acceptable passage, along with four Spanish citizens and two Cuban nationals. One gentleman, so distraught over returning to Nazi Germany, attempted suicide. He was taken to a hospital in Havana for treatment for his wounds. Today the liberals are screaming that any delay or extreme vetting of refugees from those terror-prone countries is an act of Islamophobia, even though CIA Director Brennan said during congressional testimony that refugee flows is one the ways terrorists infiltrate western nations. They are even trying to make the ignorant comparisons between the situation delaying the acceptance of refugees from the terror-prone countries and the barring of refugees from Hitler. The reason for the delay, announced Friday, was to protect American lives. The Holocaust refugees were kept out because of the bigotry of liberal hero FDR that caused approximately 200K extra Jews die in the Holocaust, because he didn’t want more Jews living in America. Bottom line: it is pure nonsense, an intellectually dishonest — or at least ignorant — argument to compare the two groups of refugees or the belief systems of the two presidents.